Summer Sweet Treats: We All Scream For Ice Cream! “I scream, you scream, we all scream for ice cream!” was a popular jazz tune in 1927 and America’s love affair with ice cream has continued through the decades. Nothing says “summer” like a cone of creamy ice cream or a dish of frozen yogurt. When it comes to delicious and creamy frozen treats, the choices are almost endless. But do you know the difference between gelato, ice cream, frozen custard and others? Ramp up your ice cream IQ with this fun frozen treat primer and learn which flavors are most popular throughout different regions of the country. Available in hard or soft-serve, ice cream is made from milk and sugar and is defined by the USDA as containing at least 10% milkfat and being churned during the freezing process. According to the Economic Research Service, Americans consumed just over 13 pound of ice cream per capita in 2016 (down from just over 16 pounds per capita in 2000). If you’re looking for something that is very similar to traditional ice cream, then gelato may be your best bet. Gelato is the Italian word for “ice cream”, and it’s also made with a base of milk and sugar. Compared to traditional ice cream, gelato has less milk fat and also has less air churned into it during freezing, so it tends to be a little richer even though it’s slightly lower in fat. For a super rich, thick frozen treat, look no further than frozen custard. Instead of milk, frozen custard is made with cream and eggs, resulting in a dense consistency. It’s usually stored at a warmer temperature than ice cream, which also helps to give it a smooth and deliciously rich flavor. This frozen dessert has roots in the Midwest and Northeast, but has more recently become a popular choice throughout the US. Frozen yogurt is made from yogurt instead of milk or cream. It’s lower in fat than frozen custard, ice cream and gelato and is sometimes a bit more tart in flavor. Like ice cream, it is available in hard and soft-serve versions, and is sometimes offered with different toppings. For a guilt-free treat, sorbet may be your best bet. This frozen treat contains fruit and sugar but no dairy. It is usually churned like ice cream and served in a scoop, but it’s not creamy. Since there is no milk or cream to dilute the fruit, sorbet flavors are often more intense. Sherbet is a fruit-based frozen dessert that is basically sorbet with some added milk, making it creamier than sorbet but not as rich as ice cream. 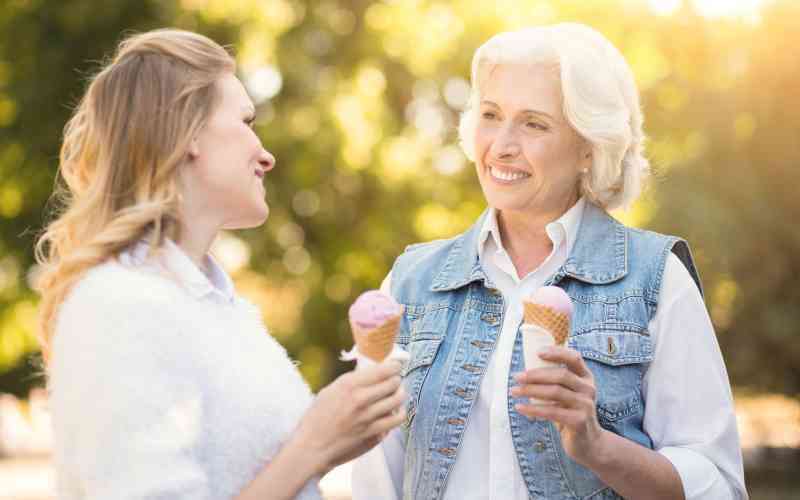 No matter your flavor preference, summer offers plenty of opportunities to gather with friends and family and enjoy delicious, frozen sweet treats. Every week this summer, The Maples is offering an Open House and Sweet Treat event. Join us on Thursdays from 4 to 6 pm to meet our friendly staff, take a tour and learn more about our senior living community. You’ll go home with a gift card to The Charmery in Towson! RSVP here or call (410) 296-8900 for details.